We interrupt the vacation photos to briefly talk about something actually related to poker. 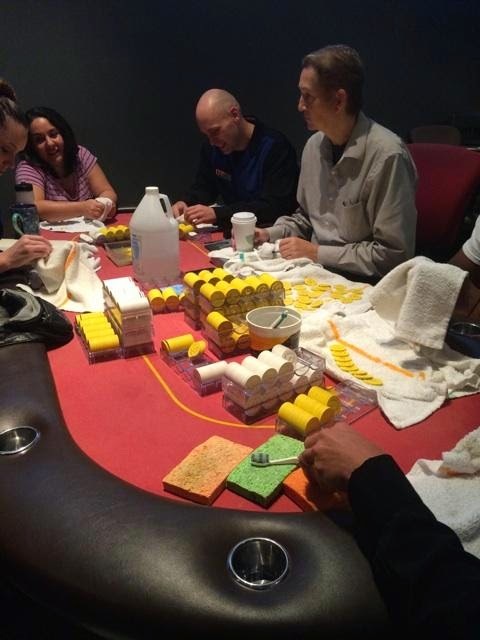 I had occasionally heard of similar group undertakings from other poker dealers, but I had never seen a picture from a chip-cleaning party. Good lord, that looks tedious. And disgusting. It reminded me of an idea I had long, long ago about cleaning poker chips, but never got around to writing about. Back in the days when I did competitive pistol shooting, I made my own ammunition. Almost everybody did. Buying commercially manufactured ammunition was just way too expensive, given the large volumes that serious shooters run through. There are four components to a rifle or pistol cartridge: the bullet, the gunpowder, the primer, and the case. The case is usually made of brass. It's the most expensive part, and the only part that is reusable. You dump your dirty brass in, along with some sort of gently abrasive dry medium (the cheapest and most popular is ground-up corn cobs), put the lid on, and let it go. A motor vibrates everything, and the medium scrubs the gunk off of your brass. An hour or so later, you sift the brass from the medium (which is reusable until it gets too nasty), and you're done. Total time investment is less than five minutes to clean several hundred cases. I think that the same sort of gizmo would work for poker chips. It wouldn't disinfect them, but it would remove the dirt and stuck-on grime handily. My only reservation in recommending this solution is that the medium might be abrasive enough to scrub off the lettering, which would not be good. But it ought to be easy to test and see if that happens. 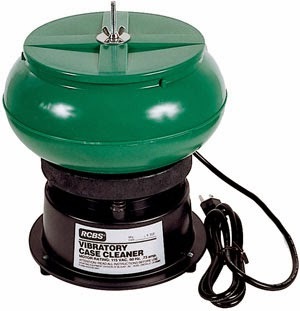 Anyway, there's my suggestion to poker rooms around the world--an easy way to clean all that disgusting glop off of your poker chips without making your dealers sit around a table laboriously scrubbing them one at a time with toothbrushes, which I'm pretty sure is prohibited by the 8th amendment clause about cruel and unusual punishment. I loved the city of York--beautiful and historic. I took so many pictures that just to show you the best ones and not have it be overwhelming, I'm dividing our day in York into three posts. This one has shots from around the city. Tomorrow's will have the photos from York Minster. The following day I'll share some pictures from a raptor show that we caught while there. The faceted tower below is not much to look at, but dates (as the sign indicates) from around 300 CE. That makes it just about the oldest man-made thing we saw on this trip, after Stonehenge and various archaeological artifacts in museums. The ruins of St. Mary's Abbey were among the most beautiful things I saw on this entire trip. This is what's left of the 13th-century building, which fell into disrepair after the despicable King Henry VIII dissolved all the monasteries and raided them for their treasures around 1540. I wandered around the ruins for quite some time, looking for interesting angles and watching how the shading of the stones changed as the sky turned from intensely blue to ominously cloudy. I don't know who that couple is, what this spot means to them, or whom they were mourning. I saw them come with the yellow flowers in hand, set them down, and step back. Then they appeared to be taken up in memories--intermittently crying and leaning on each other. It felt a little voyeuristic to be watching them. I hope that, whoever they are, they won't mind terribly that I intruded on their private moment just enough to capture what I thought was a beautiful photograph. From Liverpool, we followed the north coast of Wales to the walled town of Conwy. Conwy Castle is another amazing place. It's full of interesting rooms and nooks and crannies that I didn't have enough time to explore. I'm also just generally amazed that anything built so long ago is still standing, even if partially in ruins. We were there in the mid-afternoon of a bright, sunny day (with wicked wind). This caused harsh shadows--terrible for pictures of your relatives, but delightfully dramatic for pictures of a stone structure. This is one of the portals through the walls that surround and protect the city. Only one car at a time can fit through. I had to wait several minutes before I got a window of a few seconds when no cars were in the shot. I quickly became enthralled with the Welsh language. It looks so dang unpronounceable, but sounds so sweetly poetic when spoken. I took these shots of road signs--printed in both English and Welsh--from our speeding bus. We didn't have much time in Liverpool--an hour or so on the bus with sights being pointed out by a local tour guide, then less than two hours for lunch and looking around the docks area. See those pedestrians in the background? I caught the scofflaws red-handed, crossing the street where only humped zebras are allowed. It's true that there were no humped zebras around, so I guess the people weren't getting in the way of anything, but still--the law's the law. As the previous shots suggest, I was constantly fascinated by the British street signs, and how they differ from ours. (There will be more examples coming in future posts.) My favorite one, unfortunately, we went by in the bus too fast for me to grab a picture of it. It was in London, just before we went across an overpass. It said, "The flyover is unsuitable for cyclists." Now, how dang civilized is that?! It doesn't say, "No bicycles allowed," or have the outline of a bike with an ugly red slash through it. No. It says, "The flyover is unsuitable for cyclists." And isn't "flyover" a lovely word? So much better than "overpass." I was so taken with that wording that I just kept repeating it to the captive audience around me in the bus, in a really bad British accent. "The flyover is unsuitable for cyclists." They just stared at me, sort of the way I imagine Dan Rather stared at the guy who accosted him with "What is the frequency, Kenneth?" I loved the little signs posted on buildings around England just as much as the big road signs. I found one of my favorite examples at Albert Dock. Isn't that graphic wonderful? This one is all about the showdown, pardner. Warwick Castle is an amazing place that has, unfortunately, largely been ruined, as a place to experience, by the company (Merlin Entertainment) that has contracted to operate it as a tourist attraction. They have managed to destroy its dignity and sense of historical authenticity, in favor of making it into sort of a bad, permanent Renaissance Festival. I couldn't decide which of those two shots I liked better, so I'm posting both of them. They are actually not the same image with different manipulation, as you can probably convince yourself if you notice that there is a bird above the trees in the second one but not the first. For the second, I just metered the camera on the sky, and forced that metering on the building and landscape. (I did then slightly enhance the silhouetting digitally, but only a bit.) Which do you prefer? Photographic lesson: It's really, really hard to take a good picture of an eagle in flight, even if you know in advance exactly where it's going to be. The same happens to be true of the Andean condor, even though it flies much more slowly. This is a young Steller's sea eagle, trying to decide which of those tasty-looking children to carry away for his lunch. The views of the surrounding countryside from there are stunning. They instilled me with a whole new visual attachment to the phrase "commanding view." Launch a sneak attack on this fortress? Yeah, good luck with that.